It's time once again for Vee's Note Card Party. This is such a fun event. I chose spring flowers as a theme and all of these flowers have been seen recently on my blog, although I chose different images for some. I collect quotations and had fun paging through my book where I keep them. Some of them are written on scraps of paper and lie loose in the pages. I keep meaning to glue them in before I lose them. Do you collect words? And finally, the "box top" for the set of "note cards." For all of these photos I used the Vignette option in Picasa and then the Polaroid option. Some of the Polaroid borders turned out larger than others and I can't figure out how to make them all uniform. Anyone have any ideas? Join the party at Vee's - pleasant, interesting and kind people attend. You'll be made very welcome. Lovely flowers of spring and great quotes. I keep thinking I need to "collect" words. I see a quote or a definition and think I should write it down and then I don't. Perhaps your post will give me a nudge! Wonderful selection for Vee's party! Wonderful note cards and quotations, the box top is very nice. Yes, I collect quotes too and have them on my computer for easy access. Beautiful cards, Lorrie and I love all the quotes but especially Chesterton's. I too collect quotes. Not sure about the frame problem--they look pretty uniform to me. You might try that in another photo program online. Usually there is a tiny measurement you can manipulate. Beautiful both the flowers and the quotes, thank you for sharing. I have collected quotes nearly as long as I can remember! Positive words are so meaningful and don't cost a thing. Enjoyed the way you put the quotes together with your lovely flowers. Lorrie - how gifted you are! Your images matched with verse and the Polaroid effect is perfection! Just beautiful. I am inspired. You leave me wanting more which means I shall have to come back!! I love the delicate pink tulips - what springy and lovely notecards! Very soft and delecate images. Spring can't come fast enough. What a lovely gift those note cards would be. Even the box top, delightful. Soft, warm and romantic. Oh what a beautiful thoughtful job you did for Vee's party. Love each note card and the quotes! These are just beautiful Lorrie. I love that you added the border around the cards (I usually like to do that, too) and I love doing Polaroids so you have space for a quote at the bottom. I hadn't thought of that --very nice idea! 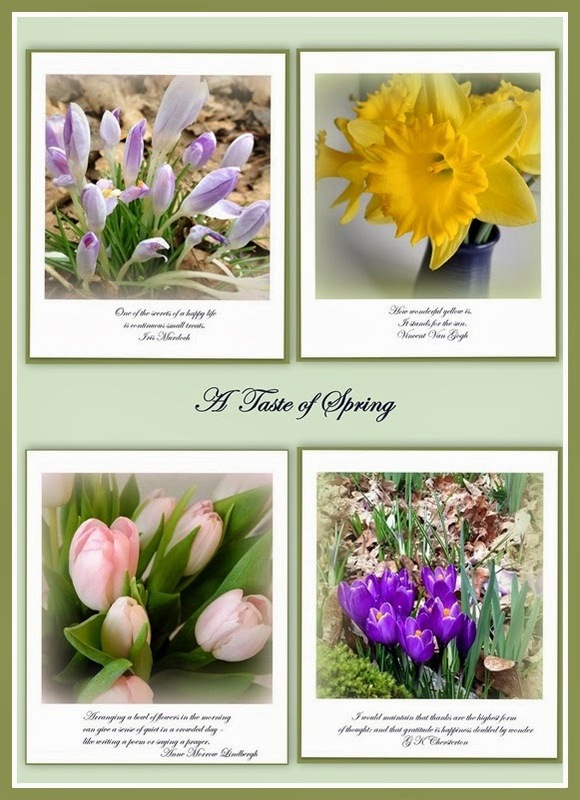 I love these images; these are definitely some of my favorite spring flowers. Crocuses are the brave ones who first pop their heads up here in our area, and daffodils are usually not far behind. I think of tulips as a luxury since they are rather high maintenance and not as easy to grow here -- but oh, they're so beautiful. I love your boxtop, too; do you think maybe some of your photos were a different size and that's why the borders are different on some? Just a thought, but I don't have any idea how to fix that. Yes, I do like to collect words. This is a lovely post, Lorrie. I hope you're having a good week. Beautiful spring Lorrie, such a lovely to look forward to. Wonderful shots for notecard. I can almost imagine my poor crocuses under 5 feet of snow and battling with the hunger of the mice because winter has gone on so long. I hope I still have bulbs come spring. I usually have note books, here there and everywhere with little bits of ideas, words and garden happenings for the next year. Love the box top. Wow, these are really beautiful Lorrie! I love the polaroid edit and the soft green borders. The quotes are perfect for each one. I have written down a few quotes that I have found on blogs but forget about them. Lovely notecards!! These cards would make a wonderful collection, Lorrie, with beautiful photos and thought-provoking quotations. Lorrie, these are absolutely beautiful cards...each one...and the quotes are just perfect! They make me long for spring even more than I already am...love your box top too! Blessings! Lovely pictures and you hit the nail on the head with each quote. Wonderful. Each quote spoke to my heart....especially the last one. Thank you! Perfection! Absolutely love the manner you post these.... the photos are sublime! Very pretty. I love your "words" collection and how you've used them on these lovely cards! I must learn more about the Picaso Application! You've done a great job. The quotes add so much to your cards. I would love to try that next time. You've even used a beautiful font! Lovely! Hugs! Oh I just love those flower pictures. They really would make beautiful note cards. Ohhhhh...love your boxtop and the cards and quotations are wonderful and beautifully chosen. I really like the quotes you've chosen to go with your pretty photos. This makes a wonderful set of note cards. I collect quotes myself. Love them. I used to collect quotes, in fact, I think I still have my old quote notebook from high school. Maybe it's time to start again. I love each and every card - and the sayings are perfect. Spring is so wonderful. Bless you for your spring offerings! These are so pretty. I especially love the jonquil. These are so beautiful, Lorrie! I think perhaps the polaroid frame size adjusts automatically depending on the amount of text you insert below the photo . . just a thought. And yes I do collect quotes as well. I use Microsoft OneNote which is kind of like a digital notebook. You can copy and paste anything into it and organize however you like. One of my favourite ways to organize. Oh my gosh Lorrie, I eagerly went back to find your Bavarian Apple Flan recipe and then stopped again at the sea glass photo you posted. You've inspired me to bake, beach comb, and check on how the daffodils are coming along in this hesitant spring. BUT it's 10:43 at night so I'll have to wait until tomorrow! These are such pretty note cards Lorrie. Your idea of adding a quote to each one is great! My favourite card is the pink tulips and the quote is special too. Your Picasa editing is wonderful. Lorrie these are so lovely - both pics and quotes. I agree with a few other commenters that the frames probably adjust size (though hardly noticeable) according to the size of the photos themselves - I'll have to see if that happens with the PicMonkey Polaroid frame option - will let you know later. Your blog is just outstanding. I have spent some time this morning reading some of your earlier posts. I was hoping to find some more pictures of the pillow in your header! Your photographs are stunning and I saw lots of note card possibilities. Very pretty Lorrie, it's good to see signs of spring everywhere...although I woke to snow this morning, lol. We can all use a bit of Spring cheer. Your photographs are gorgeous and make beautiful note cards. So very pretty, Lorrie! Your lovelies all make beautiful note cards to greet the highly anticipated season that is upon us! Thanks for sharing! I commented this afternoon, but think I somehow deleted it before it posted. At risk of repeating myself, I'll try again. Please delete this if the other shows up! Your spring blooms are so lovely. I especially love the tulips. Love your boxtop too. I also collect quotes, and try to put an appropriate quote at the end of every post. As always, your photos are beautiful, and they make perfect, cheerful note cards! Yes, I collect words...but mine aren't all in one place. That would be an improvement! Each and every one of these has me smiling. Just gorgeous! What a clever way to present them, and all of them are lovely photos. Sigh, I wish spring would hurry up and get on with more color. Absolutely lovely. When they are ready, I'll buy a box!! Very pretty! I keep some quotes but really need to write down more where I can easily get to them.